Country-living interiors now clearly belong to the past. The provincial apothecary cupboards and straw baskets have been slowly but surely replaced by rounded furniture in genuine Wallpaper magazine style because, modern is in again. But it seems that modernism always has to go hand in hand with the 60s and 70s. It's as if the real future can't be considered modern because it's scary and makes us feel vulnerable, while modernity from the past is more reassuring. The revaluation of wallpaper patterns dating back forty years seems a more lasting trend than expected. Just take a look at the vintage prints in Prada's men's collection this winter. 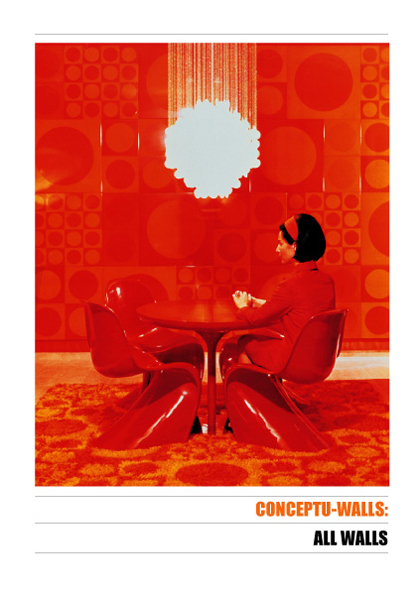 Tomorrow's Conceptuwalls are looming and design will keep returning to the years of Courrèges and Cardin. On the menu: large geometric forms, preferably with texture. Think vintage airport departure lounges. Inspirational: Scandinavian Design (picture) recently published by Taschen. (3-8228-5882-X / EUR 29.99).